Teachers went on strike Monday in Los Angeles for the first time in 30 years, driving down attendance at many schools as parents wrestled with whether to bring their children past picket lines — if they could afford the choice to keep them home. Thousands of protesters weathered heavy rain to picket outside schools before heading to a march in downtown Los Angeles. Union leaders continued to call for bolstered classroom investments, while L.A. Unified re-emphasized its “desire to find a solution to the UTLA strike as soon as possible.” Online, the Twitterverse — including political figures such as Democrat U.S. Sen. Kamala Harris — seemed to largely side with the union’s efforts. United Teachers Los Angeles on Friday rejected the district’s latest offer, which would invest $130 million to lower class sizes and add 1,200 new staff members — teachers as well as nurses, counselors, and librarians. The district is offering a 3 percent raise retroactive to 2017-18 and a 3 percent raise for this year. UTLA wants a 6.5 percent retroactive raise, a full-time nurse in every school, more special education teachers, and expanded charter school oversight, among other demands. Here’s how Day 1 of the strike unfolded in the nation’s second-largest school district. 1 Attendance fell at many schools. L.A. Unified stressed that all schools were open and students were safe and receiving instruction. But attendance was down sharply. In an evening news release, the district reported that 141,631 students attended. That’s less than 30 percent of enrollment. L.A. Unified this year enrolls about 480,000 students in its traditional K-12 schools. California school districts receive state funding based on student attendance. L.A. Unified gets $68 for each student per day. During UTLA’s nine-day 1989 teacher strike, nearly half of the district’s then-650,000 students were out of school at points. One L.A. Unified student said she would be joining her teachers on the picket line Tuesday because she felt like she was “wasting [her] time” in school on Monday. California school districts receive state funding based on student attendance. L.A. Unified gets $68 for each student per day. L.A. Unified this year enrolls about 480,000 students in traditional K-12 schools. At one school on the city’s heavily Latino east side — El Sereno Middle School — only about 25 percent of its 1,200 students were in attendance, school officials told LA School Report. LAUSD is the second largest school district in the country. It serves just under 500,000 students. While some parents kept their kids out of school to support teachers, others said they didn’t have that luxury. “I want to support the teachers, but I have to work and my daughter has to come to school,” said Josefina, who didn’t want to give her last name, as she dropped off her daughter at at Sunrise Elementary, another east side school. Another parent arriving at the school said he didn’t know there was going to be a strike. I wish I can go strike with the teachers today but I have to work ☹️ With that being said LA city rec centers and libraries are offering free child care during the strike hope this helps some of you. She had two children of neighbors and friends at home with her as well. 2 There were about 20,000 participants in UTLA’s downtown march. LA School Police early Monday afternoon estimated the number of demonstrators who gathered at Grand Park in downtown at about 20,000. At the morning news conference, Beutner said about 3,500 people were participating in protests at schools — a number UTLA disputed. The union represents more than 30,000 teachers and other district staff. 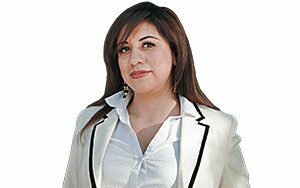 UTLA members have decried the state’s per-pupil funding — which ranks in a range of 37th to 41st to 43rd in the nation, depending on the source — and current district policies that allow class sizes to top 40 students. L.A. Unified hired about 400 substitute teachers to fill in for striking teachers, and it purchased more computer-based education programs. District 4 board member Nick Melvoin told LA School Report last month the district has about 2,000 credentialed staff, such as counselors and people from the central office, who can also step in. 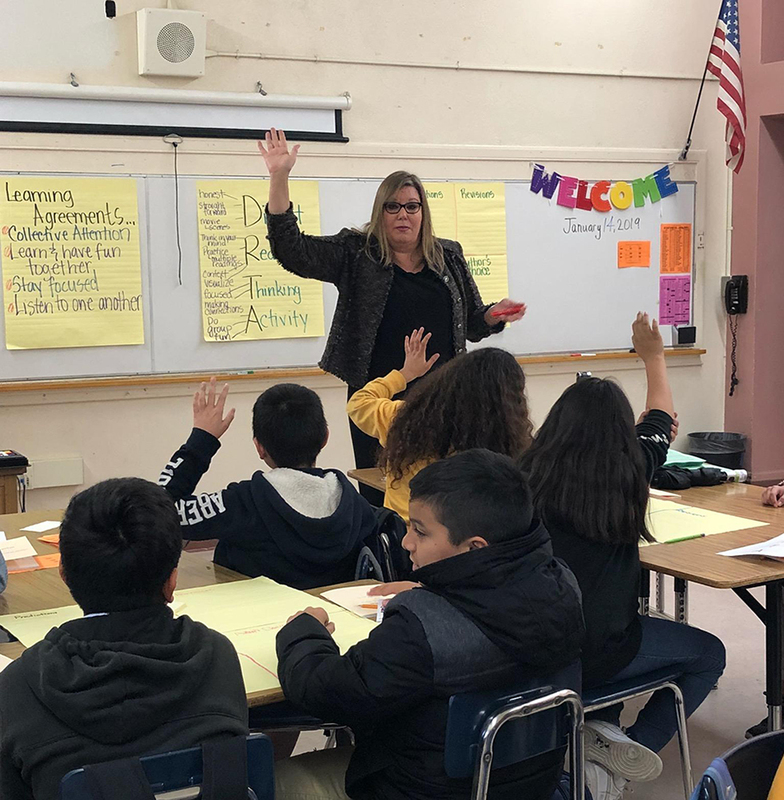 Frances Gipson, the district’s chief academic officer, returned to El Sereno Middle School on Monday, where she had been principal. 3 There were no safety issues reported. “Students are safe and learning,” he said. One tweet, however, showed strikers blocking a truck from the entrance to one school. 4 Charter schools were a central talking point. UTLA President Alex Caputo-Pearl in a morning news conference re-upped his call for a cap on charter schools and stronger charter transparency and accountability. “We need to throw privatization schemes … into the trash can right now,” he told the crowd outside Marshall High School. There are 249 independent charter schools operating in L.A. Unified serving nearly 119,000 students. The union has repeatedly rebuked charters for luring students — and, therefore, millions in state funding — away from traditional public schools. Caputo-Pearl on Monday said funding lost to charters equates to about $600 million a year. The call for a cap is not part of the formal union contract negotiations, but UTLA’s proposed contract does call for union involvement in the co-locations process, which is when charter schools are allotted unused classroom space on traditional school campuses under state law. Independent charter schools were open Monday, including co-located charters. At least one, however — Excelencia Charter Academy — closed for professional development. Tomorrow UTLA members at LAUSD-operated schools will strike. District schools will be open. All independent LA-area charter schools will be open open, staffed, and focused on student, employee, & family safety. We hope for a quick resolution. In related news, three UTLA-affiliated charter schools, The Accelerated Schools, could start a strike of their own on the second day of UTLA’s strike. If they do, it will be the first charter school strike in L.A. and the second nationally since educators at Chicago’s Acero Schools charter network went on strike in December. 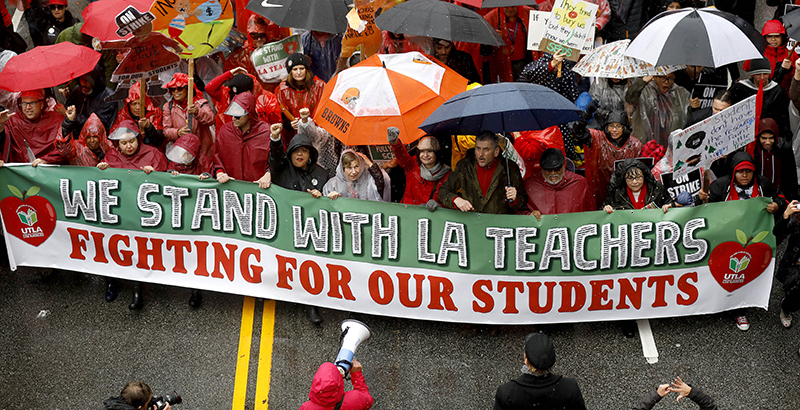 5 Politicians, celebrities & students weighed in — many supporting UTLA. Striking teachers received support from across the United States, both in person and online. Two prominent national teachers union leaders joined Los Angeles educators on the picket lines Monday: American Federation of Teachers President Randi Weingarten and National Education Association President Lily Eskelsen García. Support also poured in via Twitter from numerous celebrities, progressive organizations, and politicians — including a few Democrats said to be mulling presidential runs in 2020. Tom Perez, the chair of the Democratic National Committee, said in a statement of support, “I stand with the Los Angeles teachers.” Many teachers and union leaders also shared photos of themselves wearing red in support of UTLA. “I strongly urge all parties to go back to the negotiating table and find an immediate path forward that puts kids back into classrooms and provides parents certainty,” he said. Los Angeles Mayor Eric Garcetti tweeted a similar message on the eve of the strike, urging “both parties to keep working to reach an agreement as soon as possible so teachers and students can get back to the classroom.” He didn’t join the picketers Monday, but he tweeted out a photo with children, saying he was closely monitoring recreational centers that were offering support. Garcetti is also considering a run for the White House. New State Superintendent Tony Thurmond tweeted support for the teachers late Monday. The California Teachers Association backed him, as well as Newsom, when they were elected last fall. I support the #LAUSDStrike and our teachers. As a student of #LAUSD I have witnessed the terrible things schools and teachers go through every single day. 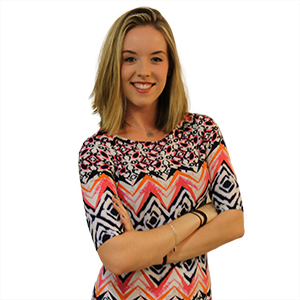 Taylor Swaak is a staff reporter at The 74. 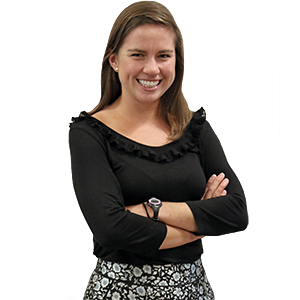 Esmeralda Fabián Romero is a senior reporter at LA School Report.